"Alternative Cartographies: Artists Claiming Public Space"
McDaniel College’s Department of Art and Art History, with generous support from the Nora Roberts Foundation, Ars Nova Student Club, and the Office of Academic Affairs, presents the exhibition "Alternative Cartographies: Artists Claiming Public Space," in the Rice Gallery in Peterson Hall, through December 18, 2015.
designate the political fabric of a nation. Despite its presumed objective basis, mapmaking represents a highly subjective, selective and flexible practice. Space brings together six contemporary international artists, Matei Bejenaru, Graham Coreil-Allen, Jason Hoylman, Daniela Kostova, Olivia Robinson, and Miryana Todorova, who are concerned with the subversive potential of cartography. Working in diverse artistic media, including performance art, drawing, video art and installation, the artists seek to convey cartography as an instrument of empowerment. They share an interest in proposing critical alternatives to our increasingly privatized and surveyed public space. 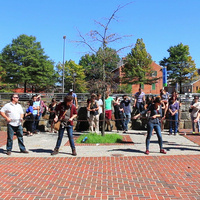 Moreover, illustrating a major worldwide trend in contemporary art, New Public Sites – McDaniel / Westminster (2015) by Graham Coreil-Allen and The Grafting of Language to Space (2015) by Jason Hoylman invite the participation of McDaniel students, staff, and faculty in the creation of their art works. learn about art works and gain insight into the process of curating an exhibition. The second special event is the “Wandering Shards Tour,” which will be held Thursday, November 19 from 11:30 a.m. to 12:15 p.m. Initiated and guided by artist Graham Coreil-Allen, this 45-minute improvised, collectively led New Public Sites walking tour visits the invisible sites and overlooked features in the everyday environment of and near the McDaniel campus. Spaces are limited to 20 participants. To sign up, email igalliera@mcdaniel.edu. The tour will begin in the Rice Gallery and is free and open to the public. For more information about Alternative Cartography: Artists Claiming Public Space please contact exhibition curator Izabel Galliera igalliera@mcdaniel.edu. Rice Gallery is located on the second floor of Peterson Hall, McDaniel College, 2 College Hill, Westminster, MD. The Gallery is open Monday-Friday, 10 a.m. – 4 p.m. and Saturday 12 noon - 5 p.m.
Requests for interpreters are welcome and can be made up to one week prior to the event by contacting interpretingservices@mcdaniel.edu. Other accommodation requests can be directed to Conference Services at 410-857-2212.